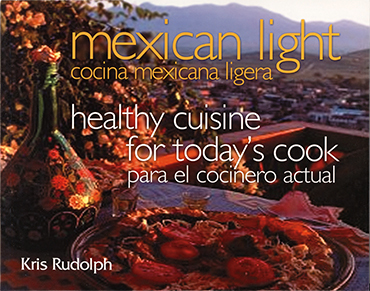 Mexican Light: Heathly Cuisine for Today's Cook is full of high-flavor, low-fat recipes that use wholesome ingredients. Featuring a combination of modern Mexican cooking and traditional dishes, Mexican Light also includes calorie charts and do-ahead dinner planning tips. 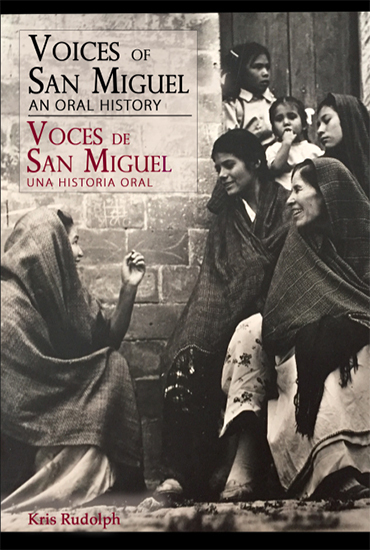 Voices of San Miguel: An Oral History is a collection of memories that tells the story of one of Mexico’s most fabled towns. Featuring a mosaic of personal accounts, told by a diverse group of residents, Voices of San Miguel recaptures life during the Mexican Revolution and Cristero War. It details the influx of American G.I.s and the birth of an artist community. San Miguel’s unique history allows for unique stories and characters, people who come alive on these pages while sharing their experiences, hardships, and joys. This book highlights the most popular dishes of one of San Miguel oldest restaurant (since 1991). 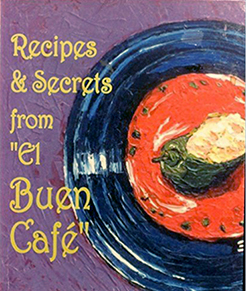 Recipes & Secrets features both Mexican and American fare as well as treats from its famed bakery, along with a dash of town history and café lore. Years ago, when I was asked to cater an event attended by Mexican President Vicente Fox, I chose this dessert, served with a Blackberry Coulis. Unfortunately the President never showed up, so he missed his chance to taste this delicious treat and I missed my chance to impress him. In the region of Oaxaca, Black Bean Soup is eaten in humble homes, as well as high-priced restaurants. It's often spiced with chiles and drizzled with cream. This filling soup makes a great first course; however, feel free to serve it as an entree, since it's basically a meal in itself. This soup is an elaborate version of the famous Lime Soup of the Yucatan Peninsula. It incorporates vegetables along with the traditional combination of key lime juice, cilantro, and chicken—it’s hearty, healthy and delicious. Chiles Rellenos come in many forms. The term literally means stuffed chile, basically any chile. This scrambled egg, bacon and cheese version is perfect for brunch. Serve with refried beans and tortillas. Chicken Poblano originally comes from Puebla, known to many as the birthplace of post-colonial Mexican cuisine. This dish is easy to prepare and will enable you to serve an elegant, authentic meal in little time. In Spanish, the term a la Mexicana, refers to any dish containing the combination of tomato, onion and serrano chile. This trio can be added to scrambled eggs, chicken, seafood, or beef, as in this recipe. Fresh fruit salsas are a great way to dress up any meal. They add flavor yet minimal calories. Mangoes are at their best in summer, juicy and full of sweetness. If all you can find are tart mangoes, add a tablespoon of brown sugar to the recipe. Pipian is a sauce made of ground pumpkin seeds, which dates back to the Aztecs. It comes in different colors, but this recipe is green and healthy. In central Mexico, Pipian s served with chicken; however, shrimp is more common to the coastal regions. This chocolate cake is good by itself, however, for a more sophisticated version splash on some Kahlua and spread a rich custard between the layers. It makes an elegant finish to any meal. This recipe pairs the ancient Mexican tradition of chiles and chocolate. The raspberry jam and chipotles transform this popular American dessert into an exciting surprise for those who dare to take a bite.